When it comes to working out and being active, one of the biggest struggles that moms face is finding the time to do it. We have kids and work and volunteer opportunities, a house to clean, meals to cook, husbands to pay attention to, and a million other responsibilities pulling for our time. Working out, heck, taking care of ourselves in general, often falls off the to do list completely. 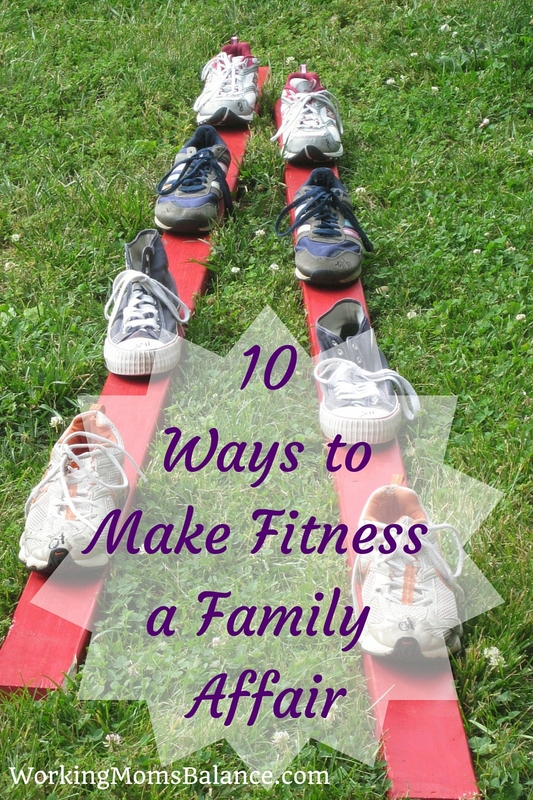 But it doesn’t have to, if we learn how to make fitness a family affair. You don’t have to sacrifice precious time with your kids in order to get a workout completed. You don’t need a gym membership to get fit. You can, and you should, include your kids in your quest for fitness. Did you know that only 1 in 3 children are physically active everyday? Did you know that only 1 in 3 adults receive the recommended amount of physical activity each week? Yep, the majority of children and adults in this country are not getting the exercise their bodies and minds need. Your body and mind are without question your most valuable possession. Shouldn’t we take care of them the best we can? Shouldn’t we figure out how to make them strong, healthy, energetic, and functioning at their best levels? Getting the physical activity that you and your children need should be one of our top priorities, and it’s probably not as difficult to fit into your schedule as you might think. Here are 10 ideas to help you start motivating your family to get active, move more, and develop the fitness you need to be your best. It starts with you. If you make excuses, your kids will too. If you don’t make it a priority to get healthy, your husband certainly won’t. If your kids see you sit in front of the TV (or your phone/laptop) all night long, they will do the same thing. Don’t wait for someone else to join you. Don’t wait for someone else to come up with an idea. Don’t wait for someone else to get motivated. If you can’t make time to workout yourself, then you have no business nagging your husband or children to get active either. Once you’ve decided to do something, let your family see it. It might feel embarrassing, but get over your fears and let your kids see you trying that new workout DVD. Don’t wait until everyone is in bed to head downstairs and jump on the treadmill. Set your small children up with toys nearby and get moving. Let your family see that your health is a priority to you, take it seriously, and they will start doing the same. 2. Involve your kids in your workouts. You wanna know where I learned to be active and exercise? It wasn’t gym class. I hated gym class. It wasn’t school sports, I was terrible at everything I tried. I learned to be active and exercise by going to my grandma’s house everyday during the summer. She had “Sweatin’ to the Oldies” and other amazing 80’s VHS workout tapes that she let us workout to with her (side note: that link goes to Amazon where you can order the updated DVD versions, for real, because everyone wants to workout with Richard Simmons still, right?). She also took us to the mall in the early mornings. Did you know old people walk laps around the mall everyday before the stores open? I know, because she dragged me along to do it, all the time. She also had a pool and often swam laps in the pool. So I did too. You might hate exercise, but your kids will probably think it’s fun, or at least funner than you think it is. And they will often make it more fun for you too. Sure, it is more challenging when your kid climbs on your back when you’re trying to do push ups. And the runs I go on with my 6 year old are painfully slower and involve a whole lot more whining than the runs I go on by myself. But it is time spent together. It is time spent being active. And it is showing our kids that our health and fitness is a priority. It is teaching our kids to move their bodies and get fit. 3. Train for something together. This is one of our family goals. My husband and I trained for our first race together shortly after we started dating. We both did terribly for our first half marathon, but it was a really great experience for us to do together in the early days of our relationship. After that race my husband swore to me he would never run a long race with me again. He decided that running just wasn’t for him. Fast forward more than a decade and I’ve somehow convinced him to train to run a full marathon (26.2 miles) with me in October. When you are more active, it’s contagious and inspiring. It can also breed a little bit of healthy competition. In the coming years our kids plan to join us on 5k races as well. Set a goal for a family fun run or some other physical event, and work hard together to hit that goal. Instead of family movie night on the weekends, why not drive to a nearby park and do some hiking? Other ideas include flying kites, going for a family bike ride on a nearby trail, or go for a swim at your local lake. You could also plan a family day bowling, miniature golfing, or jumping at a local trampoline park. There are many things you can find to do that can add some great quality family time to your schedule while also helping everyone get some exercise. 5. Unwind outdoors in the evenings. This may not be an option year-round, depending on where you live. But right now, it’s Springtime! So celebrate by turning off the TV, setting down your phone, and heading outside each night after dinner. Just a few minutes of fresh air and active play can make a huge difference for everyone in the family. Go for a family walk or bike ride, play catch in the yard, head over to the neighborhood playground, or just get some work done in the gardens and yard. 6. Collect outdoor active equipment. You don’t need to spend a lot of money on a fancy jungle gym and swing set for your backyard, but think about some more budget friendly items you can pick up at yard sales this Spring to give your family some things to do to enjoy the beautiful weather. You can collect a variety of balls, bikes, roller skates, scooters, bats and gloves, and even various yard games. Don’t forget to pickup a box of sidewalk chalk or paint as well. Since I’ve been running so much lately, I’ve realized that a lot of the places I drive to are actually well within walking or biking distance. Not everyone has this luxury, but if you live in an area close to town and with sidewalks or safe streets for bikes and pedestrians then challenge yourself (and your family) to walk or bike more often to the nearby stores and restaurants. If it’s a beautiful Saturday evening, why not walk the mile to the restaurant instead of driving? Want to go out for ice cream? Grab your bikes and earn that ice cream. 8. Make household chores fun and active. Start a dance party as you work together to clean up the kitchen. Create a contest to see who can clean up the most toys the fastest. Grab some cheap pedometers and see who can rack up the most steps while cleaning up the yard. Most household chores are somewhat active already, but with a little creativity you can really amp up the fun and the calorie burn, together. 9. Let everyone have a voice in activities. If we’re going to get everyone involved in our family fitness affair, we should probably let everyone choose some activities. Check in with your kids to see what kinds of activities they would enjoy. Create a balance in your family activities that includes something for everyone. You might hate bike rides, but if your kids love them, then snap on your helmet and go. But next week, you get to decide. 10. Schedule a family games event. This will vary depending on the ages of your children and the size of your family as well as the types of activities you want to include. You can even combine a couple families to make it even more fun. The idea is to create some competitive adventurous activities that you can do as a family. Think obstacle courses, scavenger hunts, strength contests, and even old school potato sack races and the like. Lazy Saturdays are really important for rest and refreshment, but sometimes it’s good to refresh with a little activity as well. This can be as simple or as extravagant as you want. Most importantly, keep it fun. The goal isn’t to add stress or feel like a miserable workout, it’s to get everyone moving, laughing, and enjoying quality time together while getting healthy and fit. There are lots of ways to workout as a family and it doesn’t always have to feel like a workout. Try a few things and figure out what works best for your family and your schedule. The most important thing is to find ways for everyone to increase their activity levels. Be an example and an inspiration to your kids. Do it for yourself and do it for them. Your life and your health is valuable. Make sure you treat it as valuable. 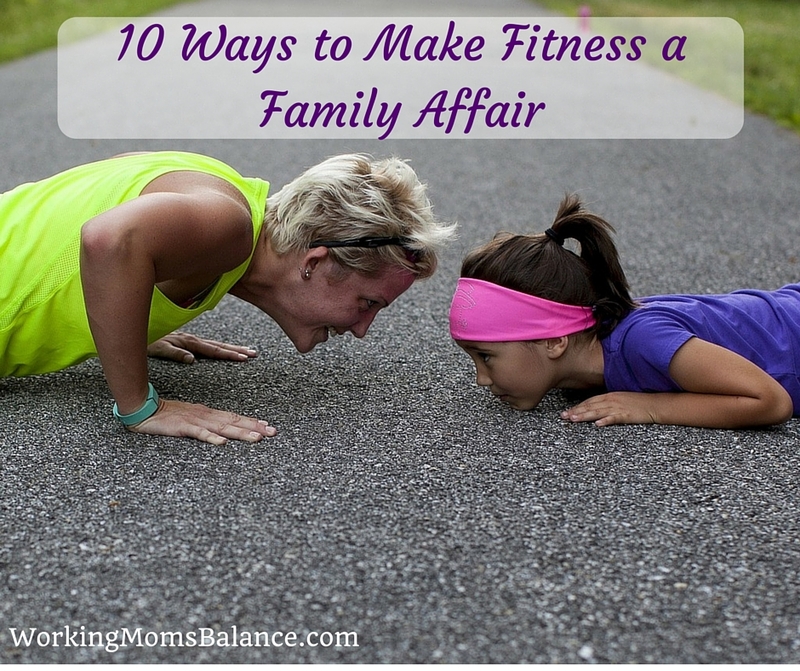 What do you do to make fitness a family affair?